The founding of Giulianova dates back to 290 BC, the year when the Romans chose it as a colony calling it Castrum Novum Piceni. The city was always a strategic point for land and sea travels for its position and for the nearby river Batinus, called Tordino today. In just a short time it became an important trading centre. In the middle ages it was precisely its position that led it through a period of decadence; the river's stagnant waters brought malaria. In 1460 the city was the backdrop for a violent battle between the Duke D'Angiò and Ferdinand I of Aragon; further to the resulting destruction and the malaise caused by the malaria, the owner of the feud Giuliantonio Acquaviva moved the inhabited centre on the hill. In 1798 the city was occupied by the French army and was then controlled by the Kingdom of Naples first and the Kingdom of the Two Sicilies later. 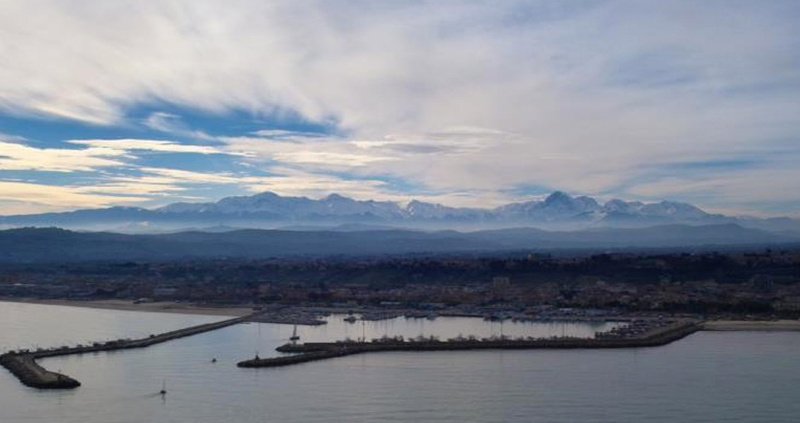 The name Giulianova was given to the city in the early 1900's, in honour to its most illustrious feudatory, and it includes both the hillside part and the seaside town (Giulianova Lido). Giulianova has many interesting artistic monuments, especially religious. The Duomo di S. Flaviano, of Renaissance style, includes a remarkable crypt with an umbrella vault, a silver reliquary of the 1400's and sculptures from the 1900's. The church of S. Maria a Mare, in Romanic style, has a beautiful thirteenth century portal. The Santuario della Madonna dello Splendore with annexed the convent of the Capuchins. The Church of S. Antonio, built around 1560 on the original Romanic system and later restored in baroque style. The Casa Maria Immacolata, built in 1550 as a monastery of Capuchins, is immersed in a splendid park where you can visit an ancient cistern, very interesting from an archaeological point of view. The Cappella dei Bartolomei, from 1876, collects bas-relief and sculptures by Pagliaccetti. Other interesting works are the "Torrione", showing what is left of the ancient city walls, the monument to Vittorio Emanuele II, a huge bronze sculpture form the 1800's and the town's art gallery. The city's most important cultural and artistic event is Estate Giuliese and it has been taking place, since 1995, in the months of July and August in the Historic Centre. The calendar changes year to year and includes appointments of various kinds: opera, theatre, classical music, jazz, operetta, ballet, visual arts. There are also many antique exhibits. Also many shows take place in the park Chico Mendez, in Giulianova Lido. Evenings at the Kursaal offer shows are held in the Art Nouveau palace, also the seat for exhibits and the fall concert season.